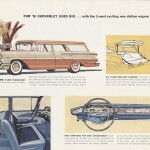 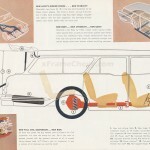 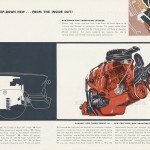 Here is the very rare ’58 station wagon brochure. 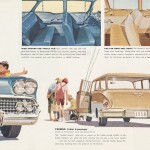 It contains all of the wagon models, Brookwood, Yeoman, Nomad. 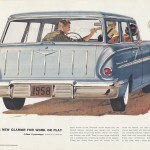 Starting in 1958, the Nomad wagon was now a 4-door model, not a 2-door like they were from ’55-’57. 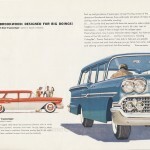 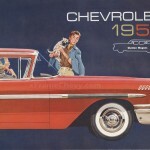 Many enthusiasts of this variety will say that Chevrolet didn’t make a Nomad after 1957, or will say that the ’58-’61 Nomads are not REAL Nomads… well, Chevrolet made them, Chevrolet called them Nomads, and they were the top of the line station wagon with a sporty trim package. 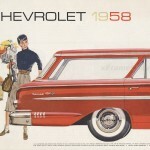 Must be a Nomad, no?